The ¿City of Angels,¿ as Puebla is also known, is full of treasures, and one of them is Barro Azul. 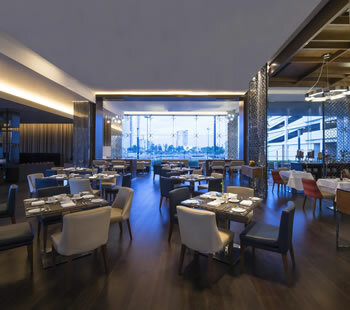 This exquisite restaurant caters to guests seeking a fine dining experience and offers a menu that brings together the traditional flavors of Puebla and Mexican cuisine with international flavors. Our refined yet simple ambiance is the perfect place to sample a wide variety of delicacies and drinks. Our chef adds a personal touch to every meal, ensuring that your experience at Barro Azul will be unique and memorable. A relaxing atmosphere designed to be experienced and enjoyed to the fullest. Choose from a selection of domestic and imported beverages perfect for any social situation: a celebration, a get-together with friends, or even a work meeting. The bar features a lounge area with two TVs where guests can catch up on the news or watch the big game. If you prefer to be outside, you can have a drink on our terrace. You choose how to make your stay Grand. Onyx furniture, hanging chairs, an exclusive vibe and a breathtaking panoramic view from the 14th floor of the Angelópolis neighborhood are just some of the features that make Sky Bar one of Puebla¿s must-see nightspots. Choose your favorite cocktail, perhaps the gin and tonic for which this bar is especially well known, and discover the history behind every delicious drink. Sky Bar is a magical place sure to surprise any visitor who walks through the door.